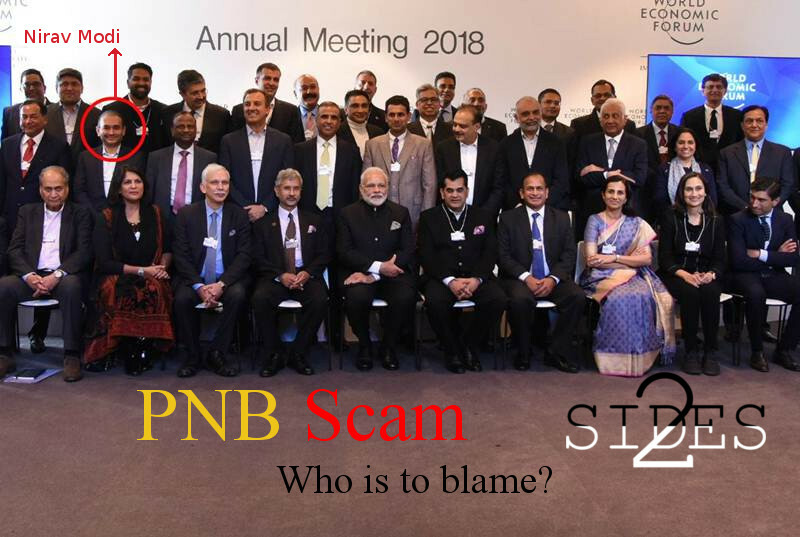 The PNB Scam - Who is to blame? 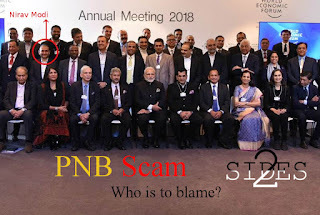 HomeScamThe PNB Scam - Who is to blame? BJP blames UPA for 'original sin' in Nirav Modi scam. Punjab National Bank (PNB), is India's second-largest public sector bank. Nirav Modi, a luxury diamond jewellery designer and Indian billionaire, stands accused of scamming PNB of a whooping Rs.11,000crore. The scam, utilising loopholes in the SWIFT system used for communication between banks, came to light on January 28 when 293 fraudulent Letters of Undertakings (LOU), issued to the accused but not found in the bank's registers, were detected at the Mid Corporate Branch, Brady House in Mumbai. The PNB scam is estimated to be the biggest financial sector fraud in Indian banking history. BJP today claimed that the "original sin" in the PNB scam was committed during the tenure of the UPA regime in 2011 and that it is Congress legacy. The system of crony capitalism that is at fault for such financial frauds on a large scale to occur in India is a direct result of the scam-ridden regime of the Congress. The NDA is helping in bringing these various scams to light and in punishing the accused by cleaning up the banking sector and tightening the norms for public sector banks. At a news conference, armed with a bundle of files, Defense Minister Nirmala Sitharaman accused Congress president Rahul Gandhi of facilitating the scam. Gitanjali Gems was suspended for 6 months from doing business on NSE in 2013. On 13 Septemeber 2013, Rahul Gandhi attends a promotion event of this jewellery group. On 15 September 2013, a proposal of restructuring and giving additional loans to the tune of Rs 1,500 crore to the same jewellery group is mooted in Allahabad Bank board meeting. Join the dots," she said, effectively accusing Rahul Gandhi of pressurising the state-run bank to sanction the loans for Nirav Modi while UPA was in power. She further said the Anita Singhvi, wife of Congress spokesperson A M Singhvi, was a director of a private holdings company, Adwait Holdings Pvt. Ltd, which had dealings with Nirav Modi's jewellery company in Mumbai. One of the directors of Allahabad bank had allegedly opposed the sanctioning of a loan to Nirav Modi and his uncle Mehul Choksi. But it was passed regardless. BJP leader Prakash Javadekar summed it up when he told reporters, “On 13 September 2013, Rahul Gandhi visited Nirav Modi’s jewellery exhibition at a hotel in Delhi and the very next day Allahabad Bank approved the loan to him (Nirav Modi), despite the fact that it was opposed by one of the bank’s directors Dinesh Dubey,”. “So, it is UPA’s scam that has been brought to light by the BJP government due to its alertness. All the non-performing assets (NPAs), the wrongful distribution of loans, among others, were all passed down to us by the UPA government,” he further said. The Congress, by its mud slinging, is merely trying to dent the impeccably honest governance of the NDA and bring down the government to its own level. Taking a dig at Prime Minister Narendra Modi regarding his recent 'pakoda' comment, Congress accused the government of being asleep at the wheel and promoting 'pakoda' jobs even as "thieves loot and flee the country". Terming it the "bank loot scam", the Congress has accused the NDA of looking the other way, helping Nirav Modi escape the country when the scam came to light. They rubbished claims of the scam being an UPA era legacy by pointing out that the CBI and PNB had shown that all 293 fraudulent LoUs discovered so far had been issued in the past two years with 143 LoUs issued over the period 2017-18 alone. The Union ministers' claims that the scam started in 2011 are nothing more than the that- claims which can hold no water and used by the BJP only to protect itself. The PMO, Enforcement Directorate and Serious Fraud Investigation Office all had allegedly turned a blind eye to multiple complaints and letters addressed to it from various persons from 2015 itself regarding Nirav Modi and PNB. One of the complainants Hari Prasad had even received an acknowledgement mail and later another email from ROC stating that the " matter has been closed after due investigation." Nirav Modi, Mehul Choksi and other high profile accused in the PNB scam joins the likes of Vijay Mallya and Lalit Modi for having fled the country. The Congress has accused the government of facilitating the exit of multiple billionaires from India when scams involving them and tons of public money came to light.